No one seemed to mind being sent to Muscat. 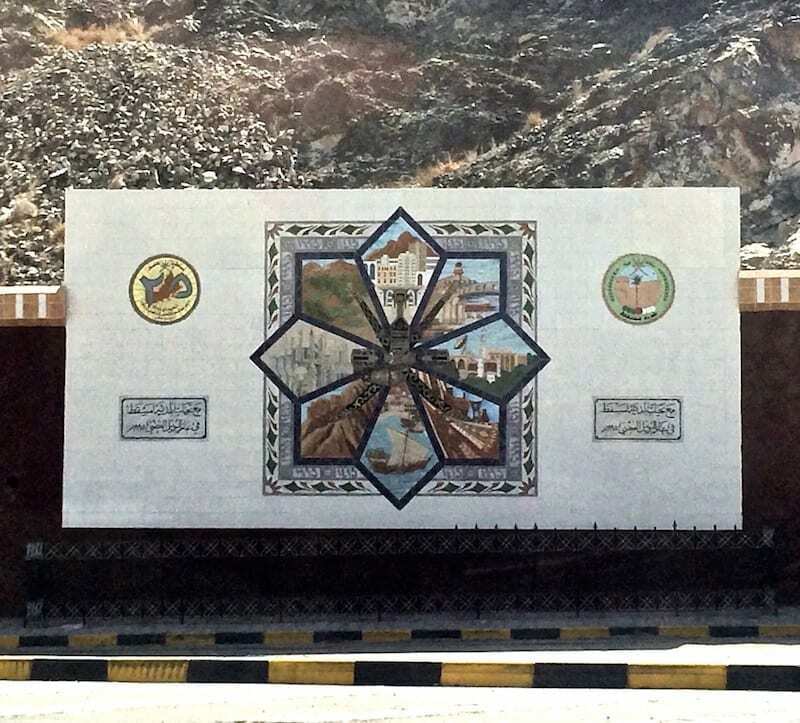 That alone created a feeling of intrigue in me, for the Sultanate of Oman. I work with a lot of international professionals. Some of my work-mates in the office are expats. Some of my counterparts in companies I deal closely with, are likewise expats. So I’m acquainted with the usual gripes of expats employed by large multinationals – especially Western ones. You see, there are many countries that career expats tend to view with much more reluctance and concern compared to others. The causes range across social opportunities, schooling for children, security, social restrictions, conservative laws, etc. But strangely, nobody really minded Oman. Even if I exclude the geologists, who understandably rave over the incredible and incredibly accessible geological formations of Oman. It was like Oman enjoyed a special bubble of exemption. Even though on the face of it, there wasn’t anything in particular that explained it. And this was basically consistent across the breadth of expat origin countries. So when there was reason for me to be sent to Muscat on a business trip, I was already curious. The first thing that struck me when I arrived, was the Omanis themselves. I watched the customs officer greet a British expat who clearly regularly passes in and out of the country, affably asked after his young family, making small talk as he did his checks. This is probably going to come out wrong, but that was the first time I’ve ever seen a non-Western government official casually address a Westerner with presumptive familiarity – like an equal – without the slightest suspicion that it wouldn’t be accepted. And the first time also that I’ve seen the Westerner reciprocate without batting an eyelash, in a most neighbourly and candid manner. Don’t get me wrong. I’ve seen it often – but up until then only from a Westerner to another. And I thought, what kind of magic place is this? And then my Malaysian brain thought, so that’s what it looks like, once you’ve completely healed from a post-colonised mindset. This is the case throughout my time in Oman. 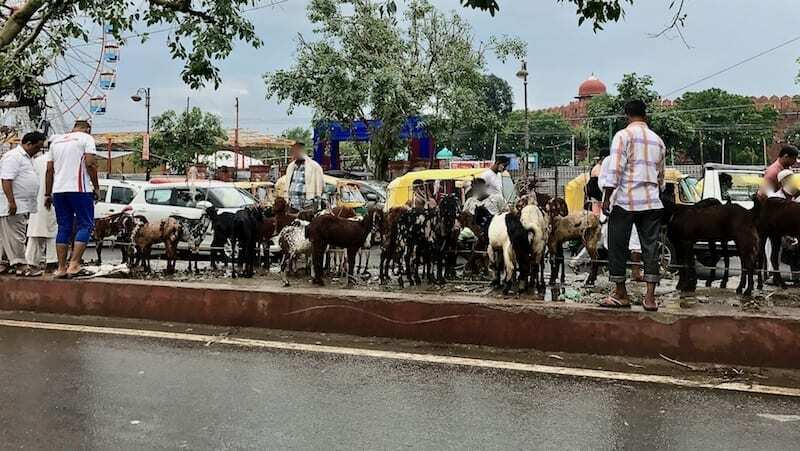 People in general – from wait staff to office worker, taxi driver to shop clerk, irrespective of whether they’re local or foreign – hold themselves with collected dignity. There was an absence of self-consciousness or defensiveness. I’m not saying that I have a terrible wardrobe. I do clean up well, when I have a mind to. But immediately on exiting the arrival hall, I felt distinctly unfashionable. How this could possibly be achieved is a mystery to me, in a place where all the men dress nearly identically, and all the women as well! But it was. It’s very strange, because it’s not like I’m not used to seeing Arab clothing. We have a lot of Arab tourists coming to Malaysia, many of whom maintain their dress while touring the country. We also have Arab style clothing enjoying a degree of popularity in Malaysia, among the Malay community especially. So it’s not about the clothes per se. You cannot tell if they are wearing designer stuff or not. Nor do they tend towards the gaudy. However, they always manage to look put-together, like their robes are perfectly tailored, never looking cheap, draping just right, and always looking pressed. They seem to always look groomed – men and women. The women, especially, seemed to glide when they walk. (I secretly peered closely at my local colleagues’ feet a few times, to try and figure out exactly how they managed this effect). And they wear a relaxed, pleasant expression. This was the other thing that struck me: Omanis are elegant. And they are elegant not in the way that makes you feel excluded. But in a way that makes you feel like maybe you ought to try a bit harder, and feel like maybe you could. I don’t really know how to describe it. It’s like taking care to be well-presented, but then seemingly forgetting about it such that there is no vanity. Now everyone who knows me probably knows my dismissiveness towards the notion of ‘fashion’. But here is a sense of the term that I can get behind, and see the point of. Where it’s not about what you wear, but how. Where it’s about achieving a shared effect of beauty and elegance, and not about showing up others. It was only in my second visit to Muscat that I was able to allocate extra time for sightseeing, after the work part of the trip was done. By then a colleague in Kuala Lumpur had moved to become an expat there, so the timing was perfect. My colleague Cindy coincidentally was also in Muscat for a completely different work reason, so the both of us crashed at our friend Chian’s place. 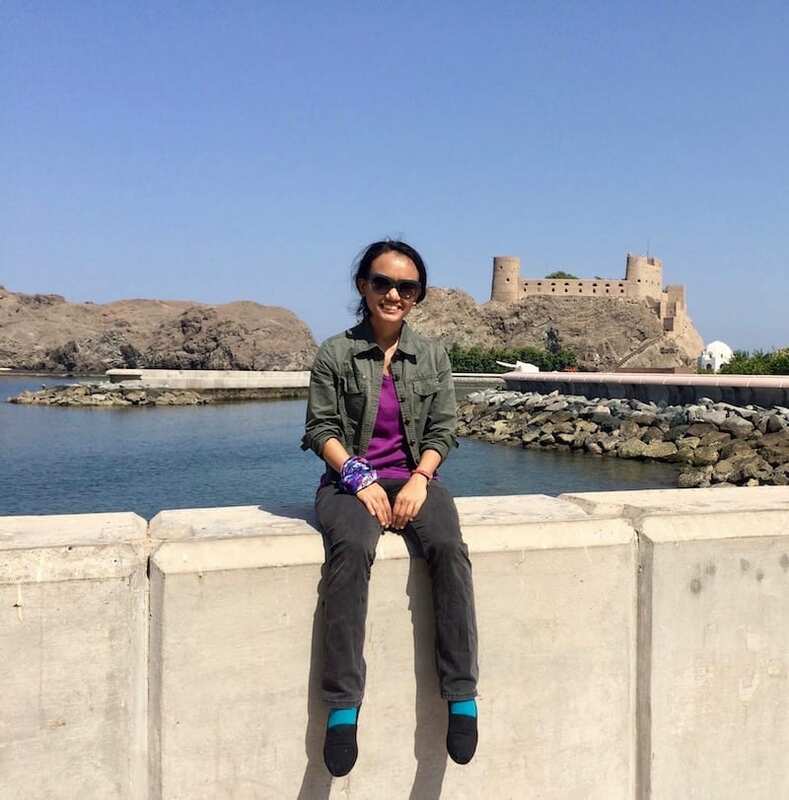 Chian had most conveniently also gone through the often-laborious effort to obtain an Omani driver’s license, so she drove us around on a tour of the Muscat essentials. Muscat does not really have a public transport system, and everybody drives. There are taxis, which you could hire for the day if you want to tour around. But of course there’s a greater degree of freedom if you have your own vehicle. 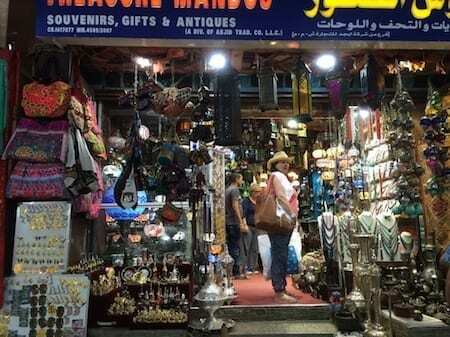 For example, you could on a whim decide you would start the tour by going away from the main attractions to explore a random local market in Wadi Al Kabir, just because you saw it on a map. The interesting thing about this market, is that the parking lot also doubles as an informal secondhand car market. This is apparently known to expats in Oman, since if you want to get rid of your car after your work stint is over, all you have to do is park the car here, leave the necessary details, and wait to be contacted by prospective buyers. Apparently this works. We were quite amused to drive into the parking lot, and while simply looking for parking, be stopped at least twice by groups of handsome Omani young men (because even guys loitering in parking lots show up properly groomed here!). Alas, they were more interested in whether Chian intended to sell the car. The market itself turned out to be just ok. Nothing too interesting was found – just regular ‘pasar malam‘* items. However, they do seem to have a wide and cheap selection of the ubiquitous embroidered hat worn by Omani men, the kuma. I didn’t buy one here, but I did buy one at the Mutrah souk for a friend. The shopkeeper even showed me how to peak the front of it, as was the trending fashion at the time. We began the ‘proper’ tour with Mutrah. Here there is an old tower at the end of a promontory. 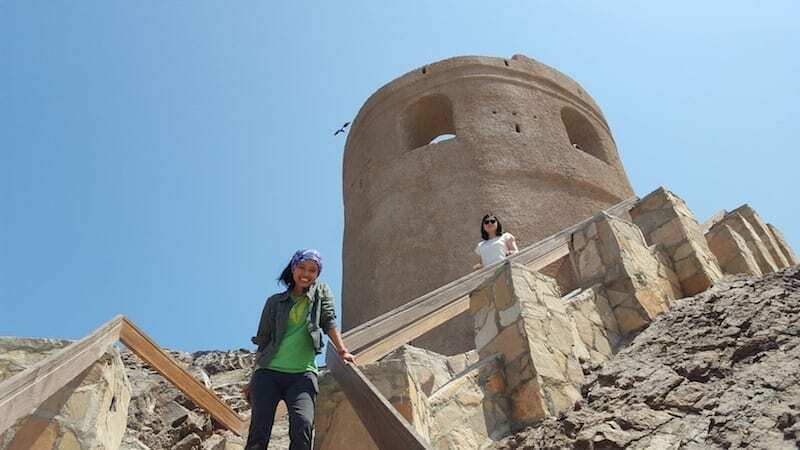 Remains of old towers and fortifications are a common sight in Oman. At the harbour mouth near the palace, there are forts looming over the entrance into the anchorage. 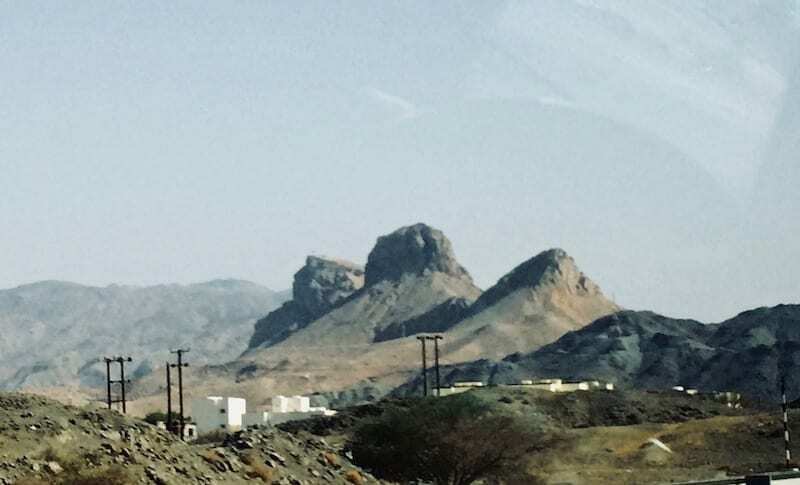 All over the Omani countryside, you could see a watchtower scattered here and there, perched on the high rocks. This watchtower is by the coastline. We parked, and decided to get up to the top, for a view of another tower on a ridge of rock opposite. There was a monument constructed next to it, in the shape of an incense burner, which was clearly new. However the hilltop was not yet open to visitors. We met a tourist taking photographs at the top of the watchtower, a spry elderly gentleman. He came ashore from a cruise ship currently anchoring at Muscat, pointing it out through one of the tower’s window arches. It was actually quite far from the watchtower, and I was impressed that he walked all that way in the heat. He was the only one of his fellow passengers who decided to come ashore to see Muscat. You gotta see the places, he said. Indeed. 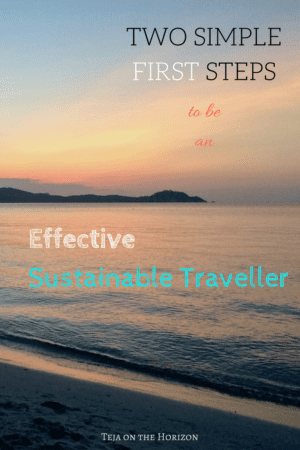 What would be the point of a world travelling cruise otherwise? 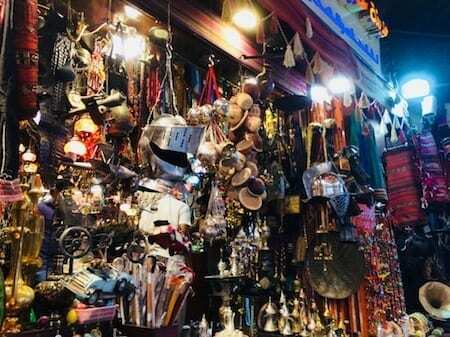 Mutrah souk is a great place to go to, to browse through Omani crafts, souvenirs, and random antiques. It does close in midday for a few hours before re-opening in late afternoon, so time your visit accordingly. And yes, bargaining is normal. 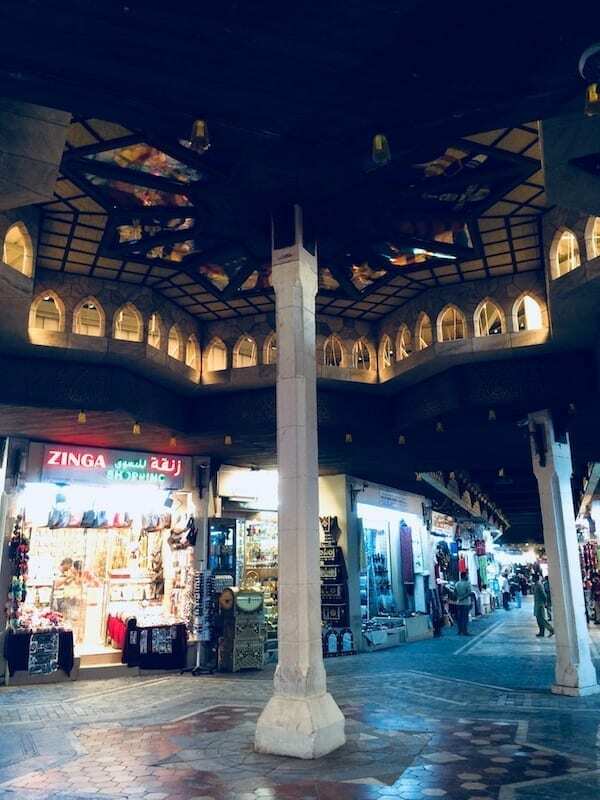 It is a charming bazaar, with ornately carved wooden panels on the ceilings, stained glass, and clever little windows that let in light at an angle to keep the souk cool in the heat of an Omani day. I really liked some of the wider inner spaces around a main column, where the multi-pointed star pattern ceilings are beautifully decorated. Not as beautiful as in palaces and mosques, but considering it’s basically a market, it’s quite lovely. Although some of the shops now just sell generic souvenir items, there are still many that sell interesting things. Since antiquity, the Arab lands have been associated with the making of perfume. And not the chemical-laden branded ones either, but the more traditional fragrance essence in oil kind. So in the souk, there’s a great range of perfumes to choose from. Now there’s a certain fragrance preference that is popular and typically associated with ‘perfume from Arabia’. I think most Malaysian Malays know what I mean – minyak atar (i.e. attar) is one of the more popular souvenirs brought home by pilgrims. However, as we browsed the perfume shops, I found that actually the newer mixes have branched out in fragrance styles. The ‘Salalah’ style for example, has a much fresher floral note to it than I usually associate with Arab perfumes. Aside from perfume, there’s also a good choice of home fragrances and incense. ‘Stuff that smells nice when burned’ is the other thing that Arab lands have been associated with since, ever. In fact, a Christmassy combo that they often have, is frankincense and myrrh in a gold-themed packaging. I mean, real frankincense and myrrh, like literally the chunks of resin. (Although they do sell them in processed form as well, like extracted into oil, as incense sticks etc.). I got some – they smell quite nice, actually. I already knew from an earlier visit to the glassmaking Venetian island of Murano, that in medieval times Arab trade was basically the only way – West or East – you could get fine glassware. Before the Venetians obtained the technology, glass was an item of great luxury in Europe. Glass windows, for example, were a sign of wealth. It is also why churches and cathedrals were decorated with stained glass – in line with how we usually display our most valued art and technology in our most sacred and beloved public buildings. In the souk there were a few shops specialising in glassware. Gorgeously coloured and decorated lamps and glass baubles – new and antique – were awfully tempting but common sense prevailed. However, I did succumb to a simple, small blue-stained glass orb. I felt capable of protecting it from breakage in my luggage. The souk is also a great place to shop for Arab clothing. Except if you’re a tiny Asian size. There aren’t things in this size. So it was much easier for me to resist the elegant embroidered robes on sale in the bazaar. However, the types of items that absorbed me the most, were the antiques. Squeeeee! Chainmail helmet! I want it! 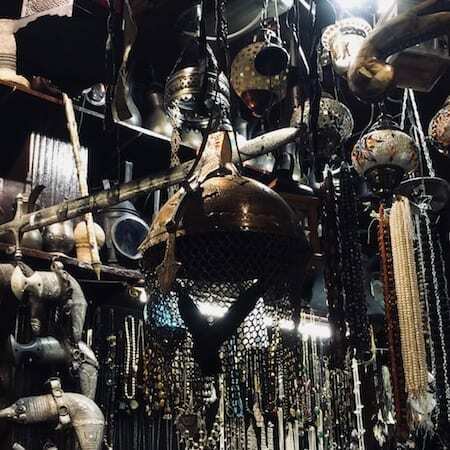 I’m glad I was actually already at the souk once before, because I think it would be quite irritating to my friends, to have me linger over random daft things like diving bells and medieval compasses, padlocks in the shape of peacocks and turtles, embossed courier scrolls and military chainmail helmets. These are the times when I’m glad I’m not rich. Otherwise I would today have a house full of ornate daggers and astrolabes, and not be able to explain what on earth for. Instead, I restrained myself to one antique brass compass/sundial combo. Now, it’s probably no surprise that a country with such obvious geological beauty would know its rocks. So semiprecious gemstones are also something to look out for in the souk, and they’re quite affordable. You could get the rough crystals as display pieces, or as jewellery. 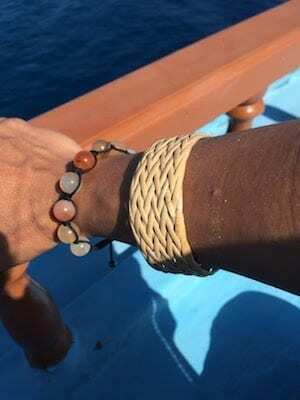 I got myself an agate bracelet which I later wore to the Maldives. 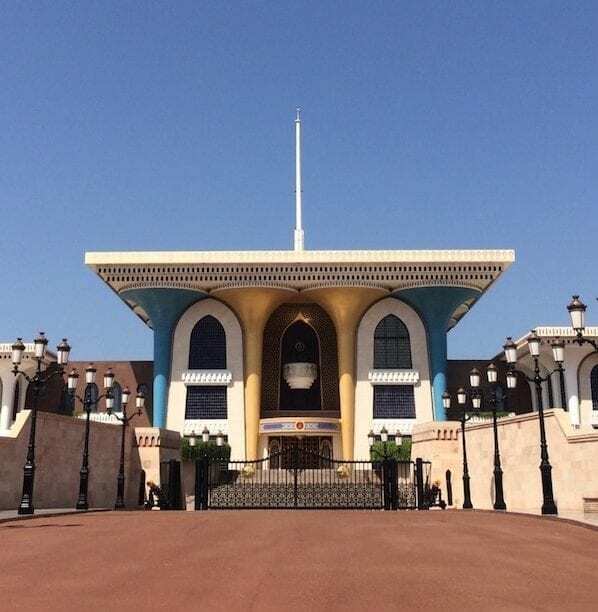 The palace of Oman’s Sultan Qaboos is in the historical old Muscat. Chian took a back route so that we would drive through the hills that loom at the back of the old city. 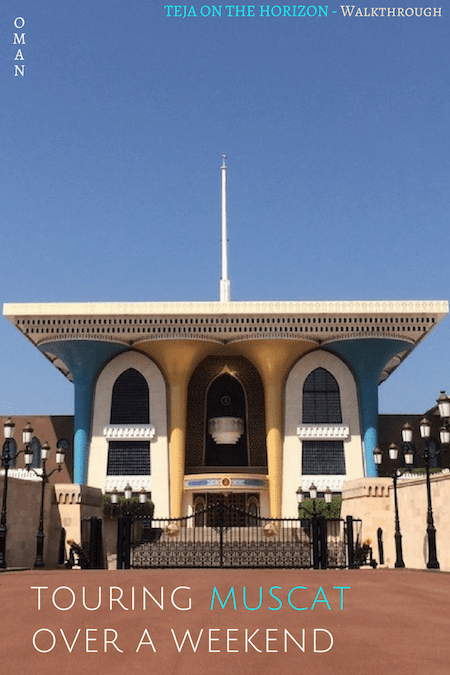 As she drove to the plaza, she pointed out the features of the houses in the area, which mark them as being original or more traditional style architecture compared to the newer areas of Muscat. An expatriate not in name only. 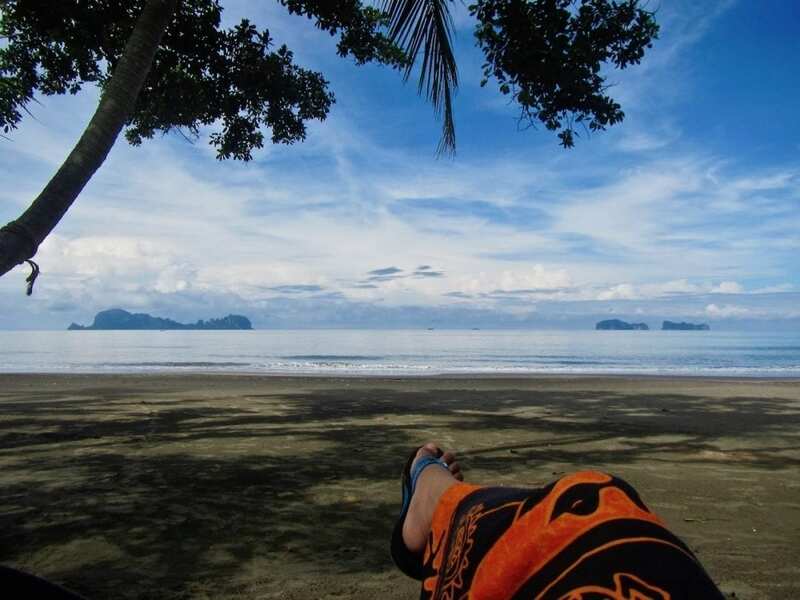 Chian is the rare kind of expat who moves to a foreign country, and makes friends with local people and is genuinely curious about their lives. By the time we came, she had even visited a local colleague’s family in her hometown far outside of Muscat. She was even able to roughly tell the difference between Arabs of different origins in the Gulf region, by sight. Consequently, in a matter of months she was already able to give us details and anecdotes that illuminate the context of Omani life and culture from the perspective of an Omani – which, to be perfectly honest, is unusual among expats in general. For example, an interesting detail about the area abutting the old city, and about parts of Oman, is that there aren’t such things as individual land titles per se. Instead there are tracts of land that belong to one clan or another. You can simply stake out a spot within this zone and put up a house or farmstead there, if you belong to that clan. The palace is a curious sort of building in that it has a quite distinctive blue and gold column facade. I thought the columns look a bit like golf tees. Perhaps that’s why it feels distinctive; I don’t think I’ve seen columns that shape anywhere else. A wide pedestrian avenue connects to a spacious square that leads to other key buildings. At the far end of the avenue past the plaza is the National Museum. As we were headed to Wahiba Sands in the afternoon, we didn’t linger. However, here you could explore several museums and walk along the harbour-side, where the Sultan’s two royal yachts are anchored. 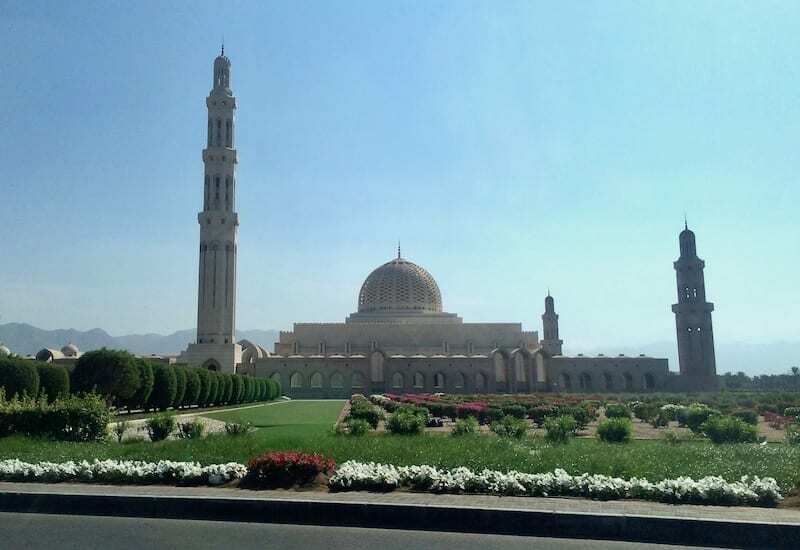 Two other Muscat attractions worth mentioning are the Grand Mosque, and the Royal Opera House. I still somehow haven’t visited the Grand Mosque after being in Muscat twice. However, colleagues who have gone report that it is well worth visiting as it is quite beautiful architecture inside and out. Non-Muslims may enter (a really good guide for dressing norms generally in the Middle East and mosque visits specifically is linked here) and there is a tour that takes you around. The verdict from my colleague who has taken the tour is mixed. On the one hand it’s a nice enough tour, but it’s sometimes self-contradictory in its narrative. And for some reason, she wasn’t allowed into the gardens, which I thought was odd. The Royal Opera House is fairly new, and near to the promenade. (According to another expat friend in Oman, at certain times in the evening, really posh cars would be driven really slowly by the Omani super rich along this promenade. I naively asked what the point of driving posh fast cars slowly was. All the better for the cars to be admired, of course!). The Opera House itself is a very impressive building. My friend Lucien approves of the acoustics. There are nice cafes and restaurants around it, even dessert-specific ones. At the time of my visit there, they were preparing for national day performances, so the military band was practicing in the plaza nearby. I also managed to see the Muscat fish market at some point. It wasn’t a very interesting market but still, it is part of the seaward side of Omani heritage. The fish being landed were generally quite large. I wondered how their fisheries are doing, since most fisheries in the world are quite stressed today. 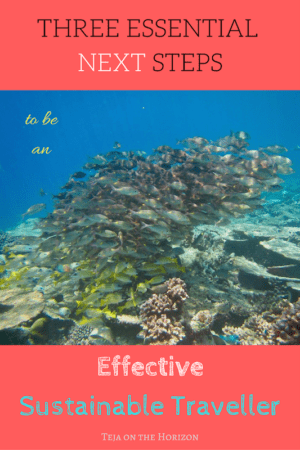 It is possible to do some scuba diving from Muscat. According to Lucien, it’s not so much a coral reef sort of diving, but more for the megafauna. I have yet to explore this. One of the nights we were all in Muscat, Chian took us to a proper Arab restaurant. The other night, we went street. Arab food is like the Eastern version of ‘meat & potatoes’. Except that it’s typically ‘meat & grains’ – like rice or bread. And just like ‘meat & potatoes’, not a lot of fruit & veg is involved. However, when you consider what much of the landscape in this region looks like, it’s somewhat understandable why culturally the cuisine came to be like that. OK, OK, I said I get it! There is agriculture in Oman in the Jabal Akhdar (literally, ‘green mountain’) highlands, and the wetter Salalah region. But overall, you get the idea. 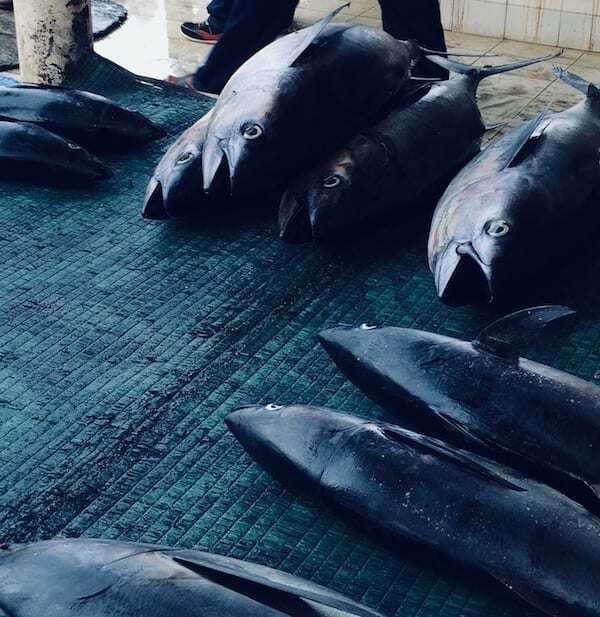 Consequently, it can be a bit tough to be vegetarian in Oman (pescatarian is still quite doable – Oman has a fishing heritage as well). I wonder whether the Omani palate would diversify more, on exposure to international cuisine. Muscat street-side kiosks or ‘warung‘ style is the more common sort of local dining out or takeout experience. We picked a place and had some pretty tasty Arab food. I can’t remember what it was, but knowing me it was probably some kind of lamb kebab. Afterwards, Chian took us on a bit of a short walk to a row of shops. It was for dessert. We went to a halwa shop. 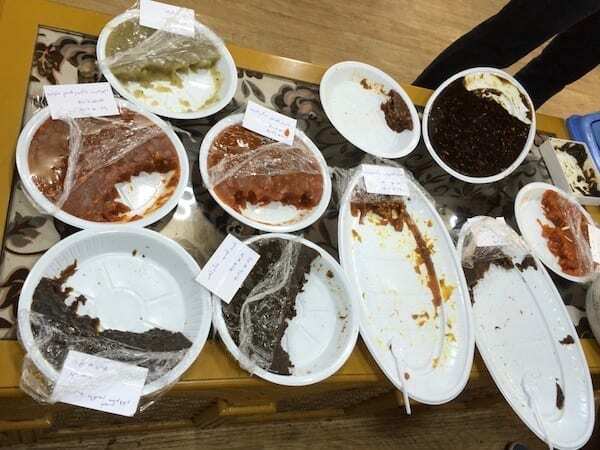 The moment we arrived we were whisked to a seating area, served some spiced Arabic coffee, and trays of different flavoured halwa were presented to us as samples. With no obligation to buy whatsoever. Apparently, it is entirely possible – and some people actually do this, which my Asian sensitivities would not allow me to do with a straight face – to drop by after dinner just for some free coffee and halwa dessert. Intentionally. Anyway, you cut out a small amount to taste from the different plates. And if you like them, you buy some to take home. I bought a plain dark sugar one, and another with saffron in. If you refrigerate them, they last forever. The most common fruit available in Oman, is the date. On our road trip to Wadi Bani Khalid and Wahiba, wherever we saw an oasis, there would be date palms being grown around it. Groundwater is also extracted to sustain date farms. So I can’t omit them in a section on Omani food. 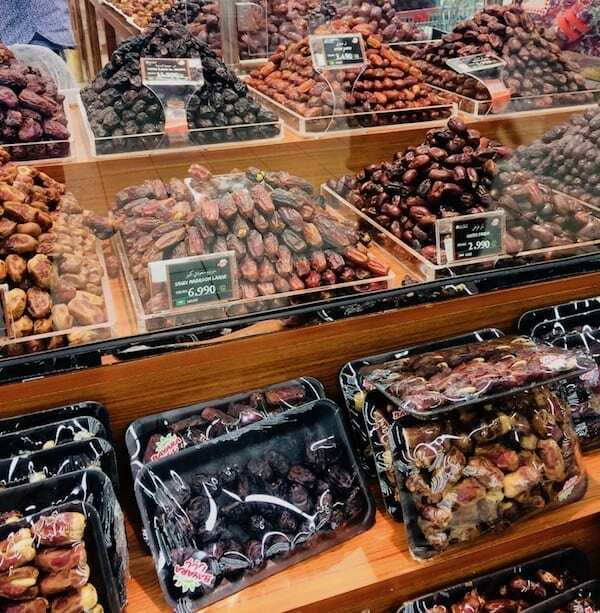 There is a great variety of dates to be found just in supermarkets. Because Muslims often eat them during Ramadan, and because Malaysians like to import other people’s food, I already know which ones I like. But it’s fun to try them all! As you travel around Muscat and Oman, have a close look at the shop names. The funny thing we noted was how literal the names are. There’s almost no branding present in the country; the shop sign will literally just say what it is a shop of. Meat shop. Grain shop. Farming supply shop. Carpet shop Etc. etc. I really should have taken example photos. At best, it might bear the name of the shop proprietor. But no ‘branding’ as we know it. I don’t know why but I thought it was awesome and hilarious at the same time. Previous story Dune Bashing and Quad Biking in Wahiba Sands! Me too! But, the war, unfortunately. 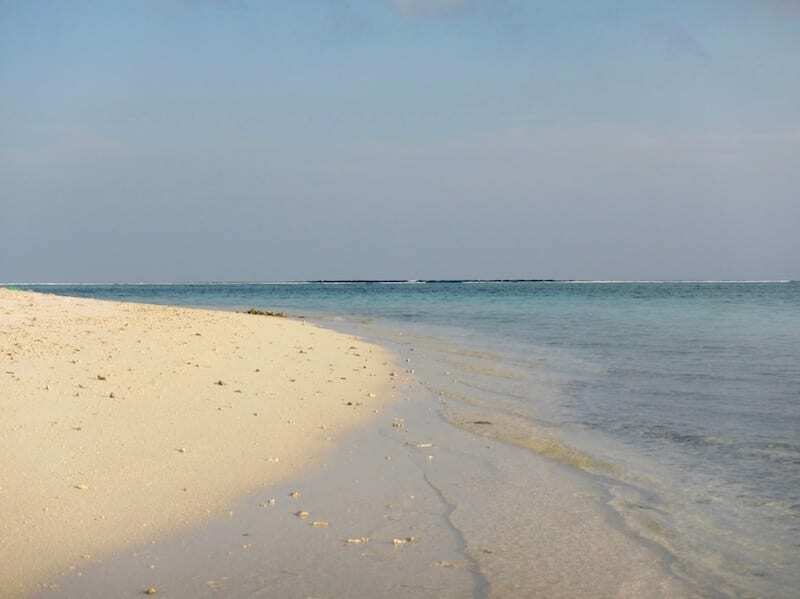 What an amazing area to visit, if it were more visitor-friendly and in an abiding peace. Wow, very nice post! I am from Yemen and I’ve never got to visit Oman although it’s right next to Yemen! Funny how often that happens! Brunei technically has a border with Malaysia – and yet after all this time I still haven’t gone to visit! Thank you Bhavi. I hoped to do it justice. I went to Salalah in Oman and enjoyed visiting. Muscat looks interesting and lots to see and do and it was interesting reading your perspective. I love the dates there, so yummy! I’m hoping there emerges a business need that requires me to visit Salalah lol ! Oman looks amazing! And Muscat looks like it is out of a movie! I have been to the Middle East several times but I have never seen a place like this! Really?? Wow I lucked out then! Huuh – Arabs have taste! Weather it comes to dresses or just fabric or making perfumes – the have an awesome taste and elegance! Great piece of reading! I was in Oman like 4 years ago, when I went to Jordan, but actually I didnt spend too much time there, thanks this article I realized I should explore more this great city!